To support our Primary School team, we are currently looking for an adaptable and inspiring PYP Classroom Teacher for a Paternity Cover (1 month). 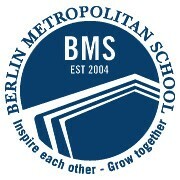 BMS is the oldest international school in the center of Berlin. 1000 students from 55 countries attend our school and are taught using the best international and national curriculum programs. The Berlin Metropolitan School is an all-day school, allowing students from kindergarten through 12th grade to complete a modern and values-based education, culminating into an internationally recognized diploma. An international team of more than 200 dedicated employees lead the way for the learning success of our students. Support and promote the school and the IB mission statements. Help select resources and manage them efficiently within the classroom. Ensure the classroom is organized, stimulating and attractive. Demonstrate effort and commitment to make lessons enjoyable and relevant to all learners. Encourage students to continue their learning independently and spark enthusiasm and love for learning by modelling this themselves. Differentiate lessons in order to accommodate for varying levels of English, ability and approaches to learning. Integrate Technology meaningfully into everyday teaching and learning. Show a good understanding and use of the school’s written curriculum and policies in their teaching practice. Be supportive of the school’s mission, an active participant in the greater life of the school and in the team with the willingness to share expertise with colleagues. Compile meaningful and effective communications for the class parents that reflect the high quality teaching & learning taking place in the class. Committed, experienced and well-qualified teacher, who seeks opportunities to extend expertise and looks for improvement to provide a high quality teaching standard. A Bachelors or Master´s degree in Primary Education with a valid teaching certification. At least three years of teaching experience in a multilingual learning environment (ideally in an IBPYP School). Experience in using technology to enrich student learning. Additional qualifications in EAL/TEFL teaching is desirable. We offer a modern, inspiring work environment with international employees and an open school community in the heart of Berlin. The opportunity to grow in an interesting environment and to define with us new quality standards in the field of education. Our co-operation and the sense of belonging together are characterized by a special team spirit and a respectful and harmonious interaction. Our open-door-culture with the leadership, joint learning and collegial case counselling creates an inspiring and supporting collaboration. We offer best conditions for a modern classroom with a comprehensive range of modern technology and resources. Besides we offer daily free lunch for our staff.